AMSTERDAM -- Amnesty International gave former NFL quarterback Colin Kaepernick its Ambassador of Conscience Award on Saturday for his kneeling protest of racial injustice that launched a sports movement and might have cost him his job. In his acceptance speech, the award-winner described police killings of African Americans and Latinos in the United States as "lawful lynchings." 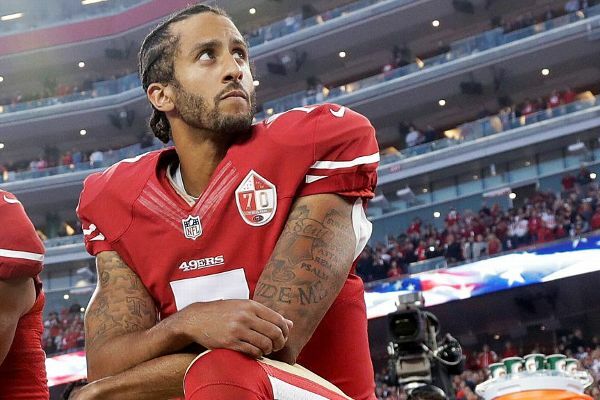 "Racialized oppression and dehumanization is woven into the very fabric of our nation -- the effects of which can be seen in the lawful lynching of black and brown people by the police, and the mass incarceration of black and brown lives in the prison industrial complex," Kaepernick said. Kaepernick first took a knee during the playing of the national anthem when he was with the 49ers in 2016 to protest police brutality. "How can you stand for the national anthem of a nation that preaches and propagates, 'freedom and justice for all,' that is so unjust to so many of the people living there?" he said at Saturday's award ceremony. Kaepernick wasn't signed for the 2017 season following his release in San Francisco. Reid, a safety who is now a free agent, continued Kaepernick's protests by kneeling during the anthem last season. Reid has said he will take a different approach in 2018. Amnesty hands its award each year to a person or organization, "dedicated to fighting injustice and using their talents to inspire others."